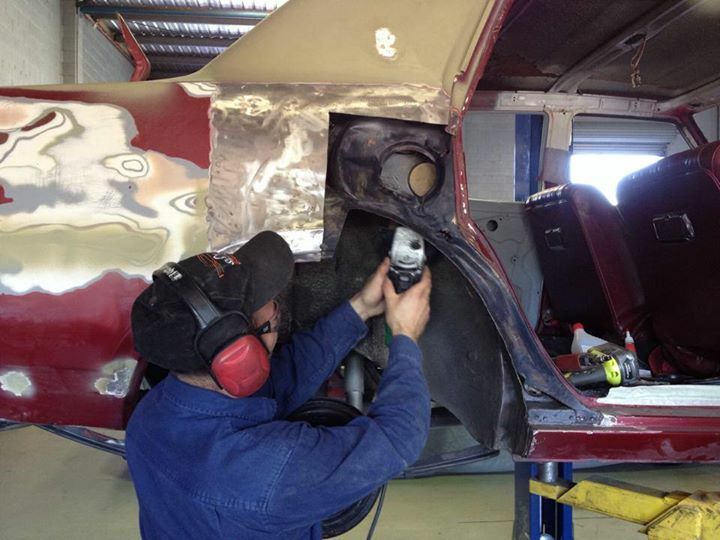 A little over a week ago I shared some photos of a HK Holden Premier currently in our workshop for a makeover including new paint. While removing the old paint we discovered some rust and a bit of accident damage. However, it was the severe accident damage to the RH quarter hidden by layers of bog that was the big surprise. As I alluded to in last week's post, bog must be applied sparingly to avoid it sinking back and/or cracking and ruining your new paint job. To avoid these problems, rust and accident damage must be properly repaired (as opposed to filling dents and rust holes with bog). Accordingly, the accident damage we found in the RH quarter panel had to be fixed. As there was significant damage to the door jam and inner structure of the RH 'dog leg' as well as the outer skin, we decided that replacing most of the dog leg with a 'cut' from a donor car was the best approach. We sourced the cut through Rare Spares (see Roland proudly holding his new dog leg below). Roland set about preparing the cut by 'unpicking' the parts of the inner structure that were not being replaced. He also trimmed the cut to the approximate size required. He than turned his attention to the damage section on the car and cleaned, unpicked and discarded the inner sections of the dog leg that were being replaced (i.e. these structures would be retained in the cut). After spending most of the day on this task, Roland has prepared, cleaned and test-fitted the two pieces ready to weld in the cut tomorrow. I will share some photos of the finished job tomorrow.